As the summer ends & school is getting back in session, there was one scene that was the swan song for Summer ’16, an event in which many players from the tri-state area showcased their skills one last time before they have to get back to the everyday grind of academics. The City is Mine tournament, which started last year at the famed Gauchos Gymnasium in the Bronx, brought out four teams filled with plenty of talent around the area for a chance to compete in a single-elimination tournament to determine bragging rights as to who had the best talent in New York. Last year, Milbank from Harlem emerged victorious. This year’s event would be no different, as the defending champions and three other teams, United Brooklyn, Team Uptown and the New York Rens, dueled it out in one of the smallest, intimate spaces ever: The beautiful confines of Terminal 23, the private facility which is operated by Brand Jordan in Midtown Manhattan. Celebrities such as New York Knicks stars Carmelo Anthony and Kristaps Porzingis, NBA journeyman and former Duke University star Dahntay Jones came out to support some great action. But the event wasn’t complete with the marvelous sounds of DJ Webstar, the on-court commentary of MC David “Cha-Ching” Teele and a musical performance of Atlantic Records recording artist, A Boogie Wit Da Hoodie. But all in all, the games showed that there is still plenty of talent in the Big Apple. Early on, both teams battled it out, but then the Rens pulled away in the middle of the game, leading 24-15, with about 10 mins left in the first half behind baskets by Baba Tall (Liberation HS) and Noah Morgan (Mount Vernon HS), as well as the playmaking ability of Jose Alvarado (Christ the King). 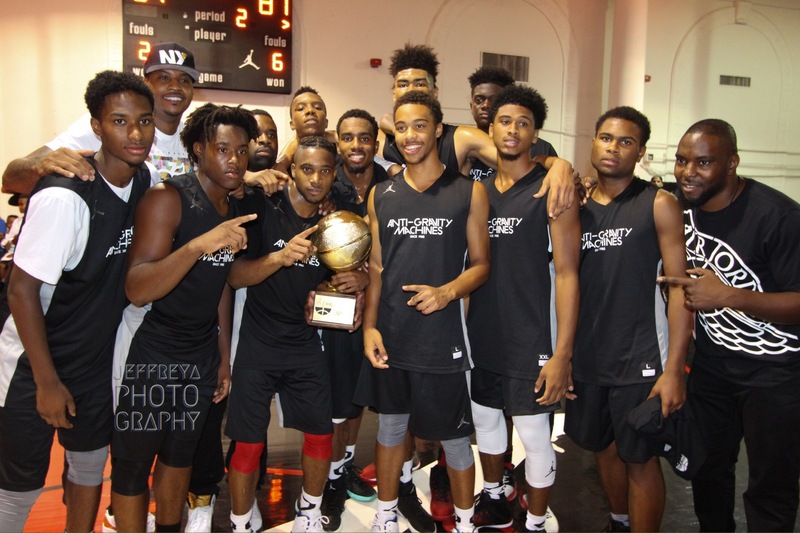 But the defending champions would not go down easy as the tandem of Isaiah Washington & Sid Wilson helped Milbank get back into the game, which led to the game going into the half at 50-47, in favor of the challengers, the Rens. As the second half started, both teams picked up the competitive pace and every possession was something that was not to be played with. With 4:03 left, Milbank took their first lead of the game at 94-91. Throughout the late stages of the second half, both teams kept up the scrappy pace. But Milbank would survive this battle, by holding down that lead & advancing to the title game. Isaiah Washington (St. Raymond HS) led Milbank with 24 points and Brandon Randolph (Westtown School) added 19 points. For the Rens, Jose Alvarado (Christ the King HS) had 33 points and Marco Morency (Mount Vernon HS) added 21 points. In the first three minutes, United Brooklyn was off to the races, leading 13-0, particularly due to their quickness. Through their size advantage with the No. 12 recruit in the country, Nick Richards (The Patrick School) in the paint, United Brooklyn had plenty of toughness in the offensive end. The first half ended with the team from Brooklyn leading by fifteen, 55-40. The second half brought some change, with Team Uptown coming back from their double-digit deficit down to five, 61-56 with 13:11 left, behind the play of Marquis Nowell (Bishop Loughlin HS). Although Team Uptown made close runs & got back in the game, United Brooklyn held on to the lead & ended up punching their ticket to the championship game. Louis King (Hudson Catholic HS) led United Brooklyn with 25 points and Richards added 19 points. For Team Uptown, Nowell led with 23 points and Saquan Singleton (Monsignor Scanlan added 20 points in the loss. From the first possession, both teams were ready for war, as both teams traded leads for a very long time. But Milbank’s post presence dominated in the late stages of the first half, helped them take a five-point lead, 48-43, into halftime. The second half was the same as both teams went back & forth with the lead. Sid Wilson (Brewster Academy) threw down some spectacular dunks to keep the crowd entertained, while also helping Milbank pull away with over 7 minutes left in the game. However, with just over 4 minutes left, United Brooklyn recaptured the lead, 84-81, & would hold on to become champions of the City is Mine tournament. For the winners and new champions, Donald Flores (Lincoln HS) led United Brooklyn with 22 points and Richards added 22 points of his own. For the former champions, Wilson led Milbank with 24 points and the No. 19 recruit in the country, Moses Brown (Archbishop Molloy HS) added 23 points. The 2016 City Is Mine Tournament Champions, United Brooklyn. Photo courtesy of Jeffrey A Photography.